Ensure the Analyse-it add-in is active in Microsoft Excel. Microsoft Excel disables an add-in if it causes frequent crashes. This behavior prevents an add-in crashing Microsoft Excel so often that you are unable to use it. Sometimes these crashes are caused by interactions between incompatible, or unreliable add-ins installed on your computer. On Excel 2007, click the Office button, and then click Excel Options. On Excel 2010 and Excel 2013, click File, and then click Options. The Excel Options window opens. The list of installed add-ins opens. The Disabled Items window opens. 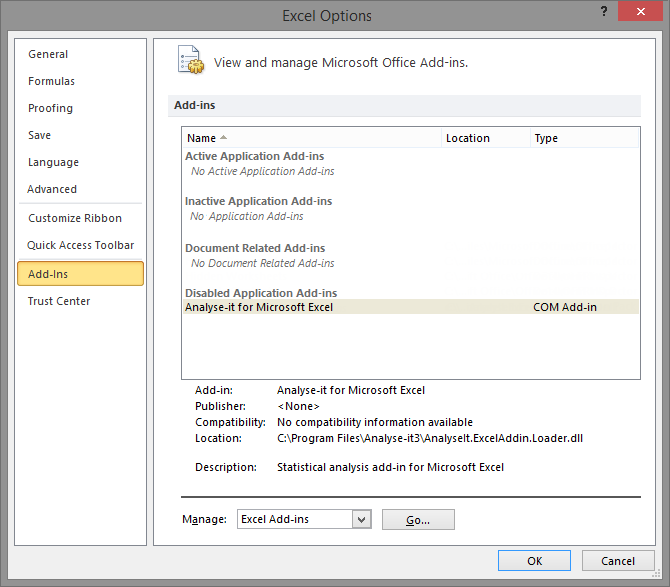 Select Add-in: Analyse-it for Microsoft Excel. Click Enable and then click Close. The COM Add-Ins window closes. Exit and restart Microsoft Excel.